Abandon any notion that the duck-billed platypus is a soft and cuddly creature -- maybe like Perry the Platypus in the Phineas and Ferb cartoon. 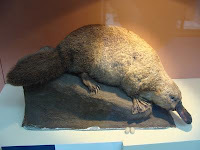 This platypus, renowned as one of the few mammals that lay eggs, also is one of only a few venomous mammals. The males can deliver a mega-sting that causes immediate, excruciating pain, like hundreds of hornet stings, leaving victims incapacitated for weeks. Now scientists are reporting an advance toward deciphering the chemical composition of the venom, with the first identification of a dozen protein building blocks. Their study is in the Journal of the American Chemical Society, a weekly publication. Masaki Kita, Daisuke Uemura, and colleagues note that spurs in the hind limb of the male platypus can deliver the venom, a cocktail of substances that cause excruciating pain. The scientists previously showed that the venom triggers certain chemical changes in cultured human nerve cells that can lead to the sensation of pain. Until now, however, scientists did not know the exact components of the venom responsible for this effect. To unlock its secrets, the scientists collected samples of platypus venom and used high-tech analytical instruments to separate and characterize its components. They identified 11 new peptides, or protein subunits, in the venom. Studies using nerve cells suggest that one of these substances, called Heptapeptide 1, is the main agent responsible for triggering pain. The substance appears to work by interacting with certain receptors in the nerve cells, they suggest. BROKE A TOOTH? GROW ANOTHER!